The Chicago Office of Emergency Management and Communications (OEMC) is the City of Chicago's hub for routing some five million annual 911 emergency calls to thousands of police and fire units, as well as being the primary contact agency for communications with the U.S.
Department of Homeland Security. 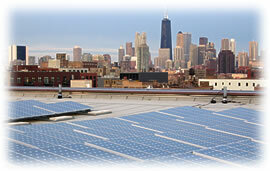 The OEMC has a 10-kilowatt solar electric photovoltaic (PV) backup system in addition to the 38-kilowatt system installed by Spire Solar Chicago in early 2002. A commercial battery system donated by ComEd stores the backup power supply, providing additional energy reliability to this load-critical application. The uninterruptible power supply will feed energy for lighting of the Joint Operations Center (JOC) housed within the OEMC. The 10-kilowatt photovoltaic system produces enough electricity to power the equivalent of 1-2 homes. It will keep the standby batteries charged, while providing pollution-free, renewable electricity year round.